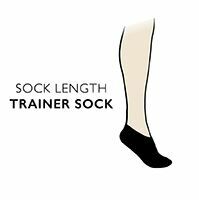 Engineered and constructed in the USA to provide better protection from blisters and foot pain for tennis players, lightly padded Thorlos Lite Tennis Micro Mini Trainer Socks sit low on the ankle. These socks, made from the company's special Thor-Wick Cool fabric, have better moisture wicking abilities for drier, cooler feet. Thorlos Lite Tennis Micro Mini Trainer Socks are padded from the heel to the toes, for a buffer system against shock and impact injury. A cushioned arch provides support for a better fit, and cushioning that goes right over the toe area protects against fast stops and lateral movement typical of racquet sports. Low profile toe seams, similar to hand linked toes for smooth seams, reduce the rubbing and irritation that leads to blisters.